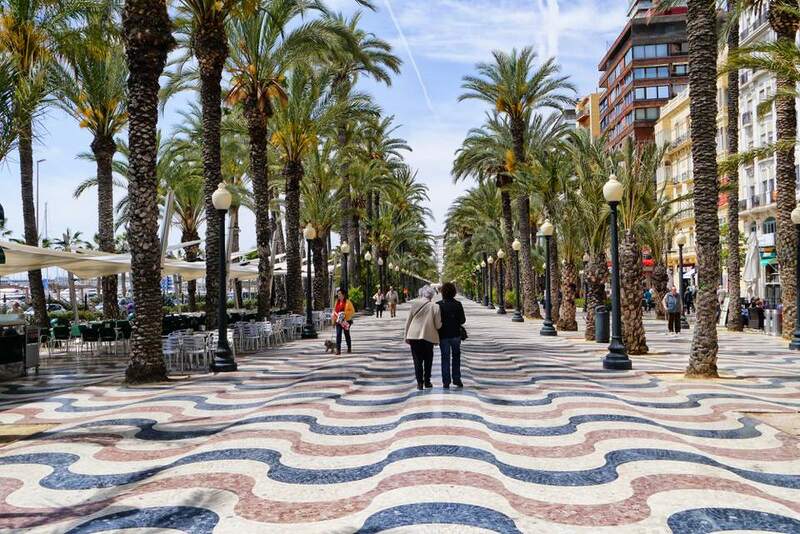 Although Barcelona is worthy of its own trip, it's also very easy to plan a beach vacation in Alicante, a port town on Spain's Costa Blanca. Both the buses and the trains are surprisingly slow along this route. Flying would be quicker but when you add check-in time plus travel to and from the airport, you may find the difference is negligible. Plus, flights will cost more money. With cases like this, it's smart to let price be your deciding factor. There is a high-speed AVE train from Alicante to Madrid, which will get you to the capital in about two hours. From here, you can transfer to another high-speed train (about 2.5 hours) to Barcelona. Because of this improved route, it would take you the same amount of time to get to Madrid and then to Barcelona by high-speed train than to go straight to Barcelona on a five-hour slow train. The only downside is that the slightly faster route is also more expensive. The train from Alicante to Barcelona takes about five hours departing from Barcelona Sants station. Departures occur almost every hour from 7 a.m. until around 6 p.m. These trains are operated by RENFE; you can book train tickets with Rail Europe. The bus takes roughly seven-and-a-half hours. ALSA is the most popular bus company in Spain, however, Movelia and Avanza are reliable options as well. Since the train and bus cost around the same amount, but the train takes half the time, the rail route is recommended. The 550-kilometer or 340-mile drive from Barcelona to Alicante takes about five hours, traveling mainly on the AP-7 road. Note that AP roads are toll roads, which can push up the price considerably. Expect to pay around 30 euros in tolls if you take this route. When you add on petrol gas and rental car rates, you might decide public transport is a better, more affordable, option. With a minimum of five hours in transit, it's not a bad idea to break up your journey by stopping to explore some of the beautiful cities along the east coast of Spain. One of the most popular routes is to make a detour to Valencia, Spain's third biggest city, as well as to the Roman ruins of Tarragona. Barcelona's public transportation is extremely easy to use. The best way around Barcelona is by metro train. There are eight metro lines that allow direct access to all the city's top tourist spots. The only downside is the metro stops running late on weekday nights, so you'll need to take a bus or a cab to get back to your hotel if you plan on staying out. All trains, buses, and trams operate under the same metro pricing system, which is convenient for travelers trying to navigate the city.